I just received the Nov 2008 issue of Chile Pepper magazine (yes, I actually do get a magazine called Chile Pepper) and found an article called “Embracing What’s Left” that has recipes for using left overs to make some spicy dishes. I’ve been getting Chile Pepper magazine for many years and this is the first such article I can remember. Hot and Sweet Asian Leftover Salad – A hot, sweet, sour and salty dressing over leftover turkey, chicken or ham with shredded cabbage, glass noodles and vegetables. Leftover Stuffing Hash – This is more like a stuffing frittata with onions, bell peppers, leftover turkey and stuffing sauteed and then mixed with eggs and cream and finished under the broiler. Wild Rice and Leftover Salad – Wild rice and left over turkey with dried cherries, pecans, chiles and vegetables drizzled with a dressing of cranberry sauce, dijon mustard, champagne vinegar and olive oil. Leftover Pot Pie – Just like it sounds using a prepared pie crust. Personally, I’d make the crust myself. Leftover Mish Mosh – Pureed cooked brussels sprouts and root vegetables with an egg as binder started in a skillet and then transferred to the oven. The specifics of the recipes aren’t that important. Take the ideas and make your own variations on these using ingredients you already have that you know your family likes. I just read that McDonalds had a big third quarter (2008) that’s being attributed to the economic downturn. Apparently, consumers are jumping on the frugal food bandwagon and think they’re being frugal by eating at McDonalds. Well, they very well may be. It really depends why they choose to go to McDonalds. True frugalites, frugalists and frugalistas know that frugality is much more wholistic than just saving a few bucks on a single meal. Personally, I have no problem with McDonalds or any other fast food chain. They make (relatively) inexpensive, (usually) quick and (arguably) tasty food. It’s certainly not the healthiest food on the planet, but it’s also not their responsibility to control what I eat. The goal of nearly every restaurant is to make their customers happy and 99.9% of customers want the best tasting food possible regardless of calories, fat, cholesterol, etc… McDonalds does that for cheap and they are successful for it. Good for them. So, to be fair to McDonalds, I offer these five frugal reasons you SHOULD eat at McDonalds and another five reasons you SHOULD NOT eat at McDonalds. Your body completely rejects anything with fiber, vitamins or nutrients. You’re completely safe at McDonalds. Feel free to eat anything on the menu. You have a rare metabolic disorder and need mass quantities of empty calories just to keep your present weight. You’re at the right place! Your doctor told you that you don’t eat enough foods from the “fatty meat” and “deep-fried” food groups. Again, anything on the menu will work. You’re training to be a competitive eater but on a very tight budget. I don’t even think Takeru Kobayashi trains at McDonalds. What does that tell ya? You think McDonalds is the cheapest way to get a hamburger. 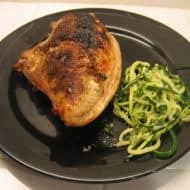 Every frugal cook knows that there is almost nothing that can’t be made at home for less money. This is no exception. You eat at McDonalds often enough to know exactly how much a meal #3 costs with tax. Take the money you think you’re saving on food and get some better health insurance because you’re going to need it. Better yet, life insurance. You would like to get to use your social security benefits one day. Eating fast food regularly will shorten your life. You could easily cook food at home that is even worse than McDonalds, so watch it! You have this crazy hang up about feeling good and living a long time. The old saying “you are what you eat” is totally true. Eat good food and you’ll feel good and live long. So now that you have some good reasons on each side, where will you eat today? Welcome readers of Almost Frugal Food! I hope you enjoy the following recipe as much as I do. This is a delicious Romanian eggplant salad that is amazingly simple and even more delicious. You won’t believe the flavor you get from just three ingredients. The key is in the specific but simple preparation. This recipe came from a Romanian friend of my sister whom she met while living in Montreal, Canada Apparently, in Romania, a party just isn’t a party without this traditional salad. I’m told that it’s common for Romanian women to roast many, many eggplants when they’re in season and then freeze them for use all year round. I can definitely vouch for the fact that roasted eggplant freezed beautifully and is nearly as good in this recipe as freshly roasted eggplant. 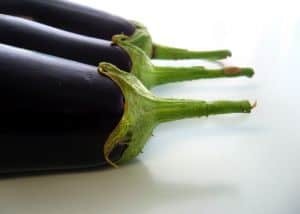 Roast eggplants in a 450F oven or on an outdoor barbecue until the insides are very soft. Let them cool in a strainer to drain well. When cool, remove the skin and mash the pulp by hand. (Using a food processor for the eggplant makes it too airy.) Puree the onion in a food processor until it starts getting soupy. I sometimes add some water to help it along. Squeeze out most of the moisture from the onion using a paper towel. Add the onion and mayo to the eggplant and mix well. Add salt to taste. It’s traditional to serve this salad with sliced tomatoes and bread. You can also use this as a spread on crackers or on a sandwich. While I’d love to share a photo showing an amazing arrangement of tomatoes and bread with this salad, I usually just grab a spoon and go to town. After you taste this salad, you might just do the same thing. Enjoy! Canned beans are great because they’re still very inexpensive and can go from unopened can to table in 5 minutes or less. 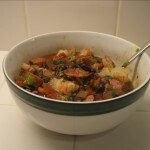 In my pantry I usually keep plain black and white beans, refried pinto and or black beans and some flavored varieties, like Cuban-style black beans. One of my favorite things to do with canned beans is to use them as a base for a leftover stew. Below is a particularly tasty mix I created for a weekend dinner when I didn’t feel like cooking. This made just one serving. Fry sausage and onion in olive oil until it is browned. Add tomato and cook for another 5 min. Add the black beans and heat through until simmering. Add the shrimp and parsley to your bowl. Add the garlic to the beans and cook another 2 minutes. Add the bean stew to your bowl and mix well. 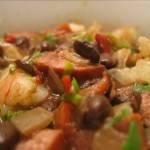 This recipe is based *VERY* loosely on the Brazillian feijoada stew that has all sorts of meat, sausage and black beans. If you like the combination of meat and beans, you should definitely look up a recipe for feijoada and give it a try. I’m sure I’ll post a recipe here soon since it’s one of my favorites. This formula could work for lots of different left over meats and vegetables. Take your left overs and add enough beans to make a nice stew and heat it through. It could be as simple as that. I like to caramelize some of the meat and vegetables first for added flavor. I also like to add fresh garlic, onion and herbs to enhance the flavor. Be creative!